Cold Streaks and Upsets: When are they Random and When are they Legitimate? Two elements of sports that often terrorize fans are cold streaks and upsets. 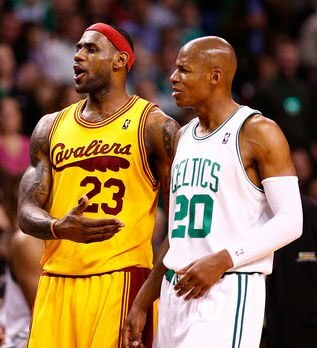 Celtics fans wept as Ray Allen missed nearly every open shot during the 2010 Finals (save for Game 2). And Cavaliers fans were almost suicidal as the Celtics manhandled the Cavaliers en route to their upset and their effective termination of LeBron James as a Cavalier. So yeah, cold streaks and upsets–they matter, at least in sports. The questions I have: Are these cold streaks and upsets fueled by random variation or are there legitimate reasons behind them? Furthermore, if there are potential causes for these athletic failures, what are they and when are they likely to emerge? In this post I will offer several answers to these questions, but most answers boil down to how pressure can negatively affect the performance of players and teams in certain contexts. First we’ll look at teams that get upset, like the 08-09 and 09-10 Cavaliers. A little over a year ago in the 08-09 Eastern Conference Finals, the Orlando Magic survived the LeBron James show (In Game 2 he had 35pts with a buzzer-beater, three other 40-point games, and a monster 37pt-12ast-14rb triple double) to win in 6 games. Although LeBron was on another level, the Cavs as a team never appeared to be totally in-sync and the Magic appeared to be in control of the series. The ECF loss was a major talking point for fans and media alike considering LeBron dominated the L and won his first MVP, the Cavs had a league-best 66-16 record during regular season, and the Cavs had just handily swept both the Pistons and Hawks. The surprising results of the series elicited many questions. Did LeBron choke? Did his teammates choke? Did the Magic have certain match-up advantages that the Cavs couldn’t cope with? Was the Orlando pick-and-roll too devastating for the Cavs? Was Mike Brown too offensively inept to lead his team past an elite defense? Was the upset the result of random chance/off-nights on behalf of the Cavs? To answer these questions, it is best to have watched the games, to intelligently analyze the statistics, and to review the arguments made by others. “…if one team is good enough to warrant beating another in 55% of its games, the weaker team will nevertheless win a 7-game series about 4 times out of 10. And if the superior team could beat its opponent, on average, 2 out of 3 times they meet, the inferior team will still win a 7-game series about once every 5 match-ups. There is really no way for a sports league to change this. In the lopsided 2/3-probability case, for example, you’d have to play a series consisting of at minimum the best of 23 games to determine the winner with what is called statistical significance, meaning the weaker team would be crowned champion 5 percent or less of the time. And in the case of one team’s having only a 55-45 edge, the shortest significant “world series” would be the best of 269 games, a tedious endeavor indeed! So sports playoff series can be fun and exciting, but being crowned “world champion” is not a reliable indication that a team is actually the best one.” (p. 70-71). 1) Don’t the players play the game? They shoot and pass and defend–doesn’t crediting randomness too much ignore the agency the players have while playing? What parts of basketball do we consider to be random chance? Refereeing, lucky bounces, and injuries/sickness, but other than that, not much else is random. 2) Berri doesn’t credit the unique dynamics of a specific team vs. team match-up. Even if the Cavs are better on the whole than the Magic against the same competition, each series has its own dynamics specific to the interactions between the systems run by each team and among the players from two teams playing. 3) The emotions and pressure tied to a 7-game series are different than those tied to a 23 or 269 game series. This pressure affects certain players/teams more than others. So although the Cavaliers may be able to win regular season games better than the Magic, maybe the Magic are better equipped to handle high pressure games for whatever reason (team culture, leadership, coaching, etc.). This is difficult to test, but certainly the Cavaliers failed again the next year in a high-pressure situation in which they were the favorites when they lost to the 09-10 Celtics. To be fair though, the Cavaliers were a slightly different team in 09-10 than in 08-09 (Shaq and Jamison, anyone?). Furthermore, the Magic, who excelled in the high-pressure situations against the Cavaliers and the Celtics in 08-09, lost to the Celtics this year, as well. But overall, objectively speaking, the Cavaliers disappointed during the LeBron James Era. Is it possible there was a fundamental reason behind their failure–something other than randomness? Forget that LeBron had no teammates–as a team, somehow, they managed to be the best regular season team for two years in a row (hint: two 82-game seasons is a large sample size). The team obviously was able to win games. Why did they falter in the playoffs? This past regular season the Cavaliers even excelled versus strong competition (unlike in 08-09). But both years the team underachieved in the playoffs. It could be randomness, but there could also be root causes as well. What if we look at a different team? Michael Jordan, basketball’s most lethal assassin, went 6/6 in his championship bouts. Although he and his team had his own playoff struggles early in his career, Jordan and the Bulls did not lose as favorites the same way the Cavaliers did. Did the balls and calls go their way, or were fundamental aspects of that team central to their success in high-pressure situations? This could be a hindsight bias, but when remembering that the Bulls had Jordan (a notoriously fearless leader) and Phil Jackson (the Zen Master), we see that the Bulls had a culture and personnel equipped to handle the high-pressure of the playoffs and Finals. Pressure matters, and different players/coaches/teams handle it differently. One question I have is whether there are more upsets in 7-game series than would be expected throughout the course of NBA history (and possibly in other major sports as well). Obviously, one would have to control for the quality of teams playing in each series, but investigating this question could point towards the psychological advantages of being an underdog and the detrimental psychological pressures of being a favorite. We may never know the exact reasons a team wins/loses, but answering that question could point towards what factors are at play in the playoffs during 7-game series. It’s clear that high-pressure situations interfere with procedural motor-skills and in turn hinder performance, at least with experts such as NBA players. But can this perspective be contextually applied to cold streaks? Let’s turn back to the concept of the hot hand for a moment–although the hot hand doesn’t exist in games, part of this is because the “hot” player starts taking more difficult shots and is confronted with tougher defense. However, in isolated shooting drills in a gym, there is some evidence for the hot hand. So, at least it is possible that in repeating the same action (this action has to be a procedural motor-skill, like shooting) over and over, one can get hot and be “unconscious.” And I suspect that similarly, a player can become “cold” over the course of repeating such a procedural action and be overly conscious. But again, this only might happen with certain players in certain situations; one might suspect that only in high pressure situations (like in the playoffs), that a player might be susceptible to the over-thinking of an automatic skill that might cause a cold streak. 2) High-pressure situations can lead to over-thinking, which can be hinder one’s performance in automatic motor-skills. Ray Allen’s continued struggles primarily took the form of missed jumpers. Although his shots came off picks, spot-up threes, and pull-up jumpers, all these forms of field goals are the same procedural skill of shooting a basketball (as opposed to floaters, layups, dunks, half hooks, etc.). In other words, despite the variables of increasingly tough defense, fatigue, and different types of shots, Ray Allen was engaging in a more consistent* and repetitive form of shooting than the average player. Taken with the above theories, it is believable that Ray Allen genuinely went cold; if players can get hot when repeating the same automatic activity over and over, and high-pressure/over-thinking leads to worse performance on automatic activities, it makes sense that the high-pressure of the NBA finals messed with Ray head, and thus his jumper, which in turn spiraled into a full-on cold streak. *=I hedge with the word “consistent” to differentiate Ray from role players such as Bruce Bowen, who really do shoot the same shots over and over, but also shoot too few shots to go “cold”. The time in between Bowen’s shots mitigates over-thinking and pressure. In other words, relative to players who attempt many field goals per game, Ray Allen has a shot selection that heavily relies on a single motor-skill. Like with upsets, it would be interesting to investigate whether volume shooters who rely on shooting rather than driving or posting up (like Ray Allen, Reggie Miller, and Allan Houston) have more cold streaks than other types of players–particularly in high-pressure situations. Similarly, we could investigate whether more cold-streaks happen in the playoffs than in the regular season–especially among “shooters” like Ray Allen, Reggie Miller, and Allan Houston. On a side note, a common piece of advice offered by player-analysts suggests that driving to the hoop and converting layups or free throws can help mitigate a cold streak. Theoretically this offers a player the opportunity to get easy points and in turn generate a confidence that eliminates over-thinking. In addition, driving to the hoop presents a new situation for the player, and hopefully the novelty of the context doesn’t present the same fears/over-thinking as the previous pattern of jump shots. Ultimately, my question is whether we can know whether an upset/cold streak is due to random chance or legitimate reasons. There is no simple answer, unfortunately, and each situation should be treated individually. In the end, randomness affects performance, along with the human tendency to falter under pressure. Although our eyes and minds often deceive us, careful video and statistical analysis can be the backbones of intelligent investigations into cold-streaks/upsets. These investigations will eventually allow us to help parse the random and the legitimate, and thus improve our decisions regarding strategy and player personnel following an upset or cold streak. What do you think about randomness versus legitimacy? Comment on the article or e-mail us at AGRbasketball (at) gmail (dot) com. Don’t forget to follow @AGRbasketball on Twitter and to like us on Facebook. This entry was posted in Just for fun, NBA analysis. Bookmark the permalink. 3 Responses to Cold Streaks and Upsets: When are they Random and When are they Legitimate? Thank you for this article. It is very well written and addresses many points well. I especially appreciate somebody pointing out a few flaws (though small) of David Berri’s work. Berri has always seemed extremely arrogant and cocky in the way he views his own data. thanks andrew. i worked at it, but there are still many questions to be answered. i think the topic still lends itself to more research. thanks for the input! I don’t like how David Berri includes games one and four of the 2009 ECF being able to go either way, yet somehow omits Cleveland’s miraculous game 2 win. That series was literally a second away from being a 4 game sweep if you want to look at hypotheticals. Only looking at the half that supports whatever theory you’re trying to establish really weakens the entire argument for those of us that actually remember what transpired in that series.